Let’s be real, life is expensive. If you’re a college student like me, you know the struggle of trying to save money without having an income…What if I told you there were (safe, non-sketchy, why-didn’t-I-think-of-that) ways to make a little extra money, without much effort on your part? Sounds pretty good right? 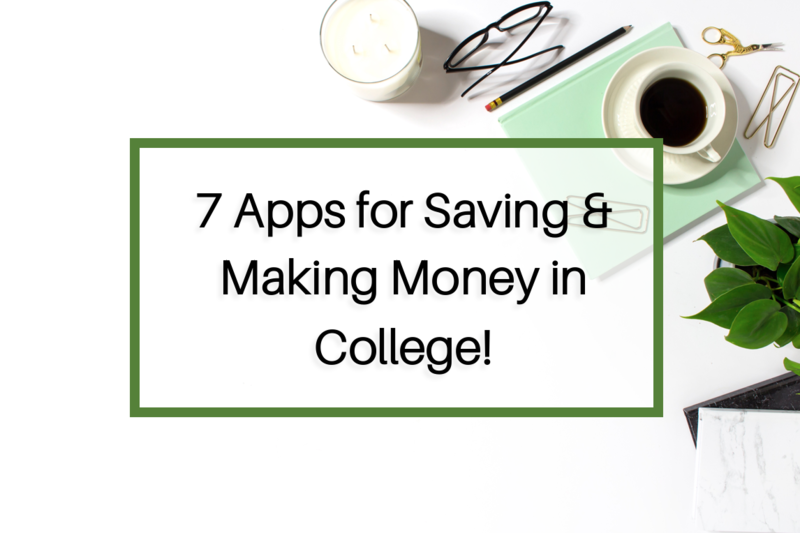 Well, these opportunities aren’t easy to find, but I did the research for ya, and found 7 money making apps that you can use right now to earn a little extra cash in college. I like to use these to save money and get cash back on things I’m buying anyway, (because I love online shopping), and to make a little extra money that I can use for fun things (and by fun I mean Starbucks and clothes)! Here are 7 apps I found that make it so easy to help you make and save money! The first 4 are apps I personally use, and the last 3 I don’t use yet, but have looked into and heard good things about from others! Swagbucks is one of the most well-known sites for making money by doing tasks like taking surveys, watching videos, and shopping online. Swagbucks rewards you in points called Swagbucks where 100 Swagbucks = $1 USD. The rewards for the tasks are small, but they add up! Once you rack up enough “SB”, you can choose from a wide variety of e-gift cards. I mostly reward myself with Starbucks (and consequentially haven’t paid out of pocket for my Frappuccino’s and iced coffee since I started using this app) and Amazon gift cards. They recently added PayPal gift cards as well if you choose to link your PayPal to your account! I’ve been using this site for almost a year, and I’ve made almost $200. For a year, this doesn’t sound like much, but it’s $200 more than I would’ve made otherwise! Your earnings from this could vary greatly with how much you use it. This is probably my favorite money making apps! Read my complete guide to making money with Swagbucks! Y’all. Once I tell you about this app you’re going to smack yourself for not learning about it sooner. Ebates literally gives you money back for your online purchases. That’s right. When you shop, you’ll make money. Again, it’s not much! We’re talking 1-12% back on your purchase (from qualifying stores), but again, it really does add up. They also give you a free $10 bonus when you sign up and make your first purchase over $25 in the allotted time. Ebates sends out “Big Fat Checks” on a quarterly basis, and will either send you a check or put that money directly into your PayPal account. I just started using this and just got my first $12 sent right to my PayPal. As in, I made $12 buying something I would’ve bought anyway. Cha-ching! Oh man, do I love this app. As far as money making apps go, this is the absolute easiest one to use! Acheivemint pays you for pretty much just living. Okay, not quite, but it does pay you for eating, drinking water, sleeping, and walking around, so that’s pretty darn close. If you wear a Fitbit, use MyFitnessPal (for tracking food, weight, and exercise), or have an iPhone (which is logging your steps and activity in the health app whether you know it or not), you’re tracking your health data. And that’s exactly what Achievemint pays you to do! Acheivement rewards you points (10,000 points = $10) for your steps and logged meals, water, sleep, and exercises. The points vary and again, add up slowly, but I wear a Fitbit and track my meals daily. So I made $10 for doing absolutely nothing extra besides signing up for this app, and I’m already halfway to my next payout. There’s no reason not to use this one, it’s so easy! Acheivement syncs with your Fitbit, Apple Health app, and a bunch of other fitness apps to track your data without you doing a single thing. Once you earn 10,000 points, you can cash out for that $10. Again, $10 isn’t much, but it’s $10 for just doing what you’re already doing! There are lots of other sites out there similar to this one, but they basically let you buy and sell used stuff. Poshmark is full of “Poshmarkers” that are just regular people who sell their stuff at super discounted prices. Poshmark is aimed at being more “posh” that other sites, and is marketed for mostly brand-name stuff. Because of this, you can find new or used designer clothing, shoes, and accessories for a fraction of retail price! I don’t have much experience selling stuff on here, but it’s great for finding things you want for less, or selling clothes you don’t wear anymore. I’m all for donating clothes, and I do donate lots of my stuff each year, but Poshmark is great for selling more expensive items that are still in good condition. With Poshmark, you can save money and let others make some! Some people are against these kind of sites because they’d rather just donate all their stuff that they don’t want, but I think these apps are a great way to save money yourself, while helping out others trying to do exactly the same thing! Digit is a smart app that links to your checking account to help you save money! It monitors your spending and income, and takes small amounts and puts them into savings for you. By taking “smart” small amounts at a time, you’ll be saving without really noticing, until you choose to access that savings! They have a free trial period, and after that a monthly subscription is $3/month. This app would be great to use to save a little extra money over time, without really noticing the loss! This app lets you “tip yourself” as a reward for whatever you want, and lets you transfer money to their ‘secure tip jar’ for a rainy day. I love the premise of this app, you reward yourself and save money! It’s also completely free to use. Acorns is app that rounds up your purchases to the nearest dollar, and then automatically invests that money for you! That way, you’re saving small amounts of money without even thinking about it, and you’ll eventually get a return on your investments! Acorns is $1/month, but free for college students with a .edu email! I hope you enjoyed learning about these money making apps, who would’ve thought, right?! Some of them are truly too easy to pass up. Let me know if you decide to try any of these! Loved this post! Totally going to have to download some of these apps! Great information! I have never heard of these. Thanks for reviewing them! How long do you spend on average doing the Swagbucks activities? Oh haha! It is kinda hard at first maybe I could do a whole post just on how to use swagbucks! But I’m sure you could google some posts to help you out! Gotcha! I think it’s even good to do just for a few minutes a day, the points slowly add up! Thanks for sharing this info! I’m gonna have to check some of these out. You’re welcome! I’m happy to help.